AFP San Diego Mentorship Program: Share your wisdom or gain some – it’s a win-win for all! 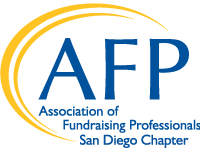 The goal of the AFP San Diego Mentorship Program is to help new (or experienced) development professionals find answers to their questions about any area of fundraising by providing a positive relationship with an experienced professional who will serve as a one-on-one mentor and provide professional guidance. AFP San Diego will match experienced professionals with AFP San Diego members or non-members who have requested a mentor. The mentor is to provide the mentee with advice and information. The advice will be limited to career advice and/or specific fundraising advice to be used to enhance the fundraising program of the charitable organization with which the partner is associated or to assist the mentee with entering the field. The partnership is a four month commitment. The actual time involvement is dependent on the participants, however it would be expected that those involved in the program would meet face-to-face once each month, with phone calls and emails on an as-needed basis. The Mentorship Program is free to AFP San Diego members. Non-members are asked to pay $40. If you are interested in the Mentorship Program, whether as a mentor or mentee, please fill out the appropriate application below and submit to the AFP San Diego office at katiegomez@afpsd.org. You will then be contacted by the Mentorship Chair who will match you with your mentor/mentee. Together with Southwest Airlines, AFP San Diego encourages and facilitates mentoring that strengthens the region by educating development professionals and nonprofit leaders in best practices in fundraising and applying the high standards of the AFP Code of Ethics.